I rebuilt a PAiA 4700 modular synthesizer for a customer. The customer built a custom cabinet and I and restored each of the modules. I also built a custom power supply, power supply distribution boards, and several custom modules. 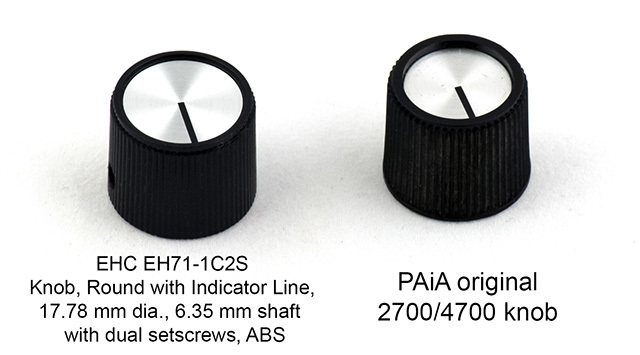 The original PAiA knobs are no longer manufactured. They were push-on designed for splined or split-shaft potentiometers. They are 0.680" diameter on the front and taper to 0.720" on the rear and are 0.620" tall. I found the EHC EH71-1C2S knobs are almost a perfect replacement. They have dual set screws for a round shaft so they will fit on most any potentiometer shaft. They are straight wall (not tapered) and the silver inset is not set quite as deep. Newark and Allied Electronics carry them.